Retail is a game of carefully manipulated psychology. For the system of exchanging goods for monetary gain to work, there must be a sense of desire for the goods in question. About a decade ago, on West Broadway in the heart of SoHo in New York City, there was a young boy aged 13 visiting the southern tip of Manhattan for the first time. When he walked into French Connection, that acute sense of desire was palpable. The store was curated to a tee and emitted a force of coolness, relevance and market readiness. It was clothing that was conversational but approachable, edgy but wearable. Fast forward to present day; that 13-year-old wide-eyed sartorially attuned young boy is now a 24-year-old young man, and walking into that same French Connection store in the heart of SoHo, the desire is no longer there. Reason being, the boy has changed but the context has stayed the same. The boy in question has matured and his sense of taste and flair has evolved, somehow French Connections’ has reached no such peak. Price Point: Visualize an enclave that houses standard garments of notable quality and moderate price point. French Connection has you covered if building a sustainable wardrobe on a frugal budget is the goal. The average ticket is a step above the Zaras and H&Ms of the world, while still being significantly more affordable than APC or Rag & Bone. Starting with a soft cotton sweater with toweling front and print at $118 (starting at $89). 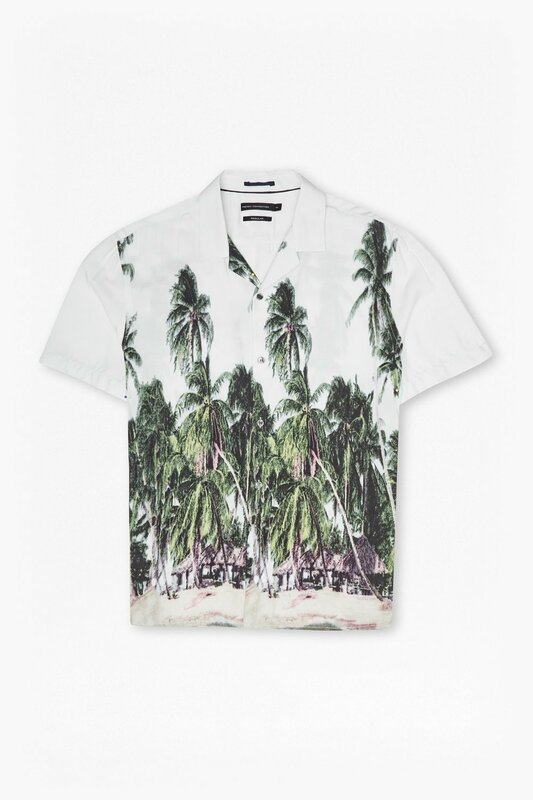 Moving along to shirts, such as their Prada inspired short sleeve palm tree graphic number, at $98. Its brethren can range from $88 up to $119. Denim, denim, denim – a categorical favorite. The going rate is anywhere between $128 and $148 on average. The Co skinny jeans in a dark rinse at $128 are a very easy to integrate and are an unfussy pick. Classic chinos, of which are top sellers for the brand, are priced from $66-$88; this $66 camel pair promises to be a sleek intersection between casual and business smart. Furthermore, there are shorts at a median price of $88, and swim trunks (aka casual summer shorts) for a going rate of $68-$78 on average. Lastly, one cannot forget jackets. These are the centerpieces of all photogenic ensembles. 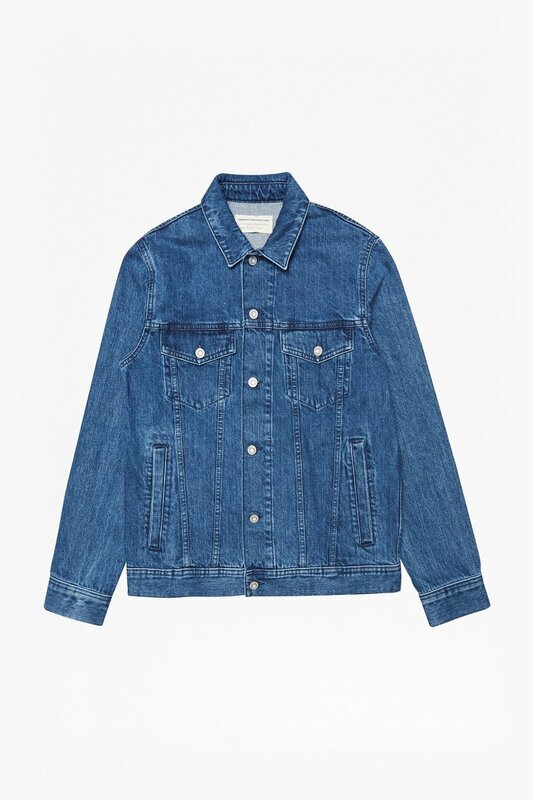 French Connection’s bleached denim jacket, tagged at $158, looks crisp, conventional and expensive. The Good: They carry XS and XXL, the commonly disregarded sizes. This is a tool to expand upon the type of men who can enjoy the brand. Furthermore, the breadth of the product assortment is healthy. In most stores the inventory in the men’s section is often malnourished, while the women’s section is robust and overstocked. The pieces featured in the men’s section appear to be well made and at the very least well designed. There is ample supply of casual menswear classics such as denim jackets, chambray shirts, cotton chinos and sweaters with subtle abstract patterns on them. For the consumer willing to pay $100 for a sweater that was likely made in a factory in Bangladesh, French Connection is a viable shopping resource. The Bad: The store layout is outdated and incredibly unexciting. The interior aesthetic and product offering does not warrant the price point. While the featured items appear to be of quality and certainly check the box in all categories, they are frustratingly standard (or basic to be a bit more direct). As it concerns the look of the store, nothing about the way French Connection’s brick-and-mortar in SoHo is established entices a consumer to want to come in and purchase. Ambience is a key tool in engaging new and noteworthy business. In the age of inimitably proficient e-commerce, there must be a reason outside of product for a person to want to venture into a retail store. Keeping the layout from over a decade prior is not a skilled or attuned tactic to get an enthusiastic consumer base into a physical location. Cufflinks: Anachronism is a major set-back in fashion, as this is an industry built on the motif of constantly moving forward. For any given entity (be it a publication, influencer, design house or retail chain) to have “staying power,” they must embrace and initiate a sense of novelty and evolution on a calculable basis. French Connection has excelled at remaining true to the brand that it is and providing consumers with consistency and reliable offering. They have not become clones of higher end brands and the fast fashion trade-offs, of whom feature outlandish and over-designed pieces for added effect. Unfortunately, they also have not adapted to the fast paced, trend recycling and aesthetic obsessed consumerist mentality of today. What this means for French Connection as a brand and a business is contentious. One thing is for sure, that store on West Broadway in the heart of SoHo will always be the base point of where the young boy now a young man discovered his biting love for fashion.